In these post-modern times we have to ask ourselves what is meant by actual reality. I suppose the simplest response is that it is not virtual reality. This story presents us with the challenge of multiple realities, or that there are more universes just next door to this one. Consider for a moment the idea of a veritable terrace of universes that meanders like a mad housing estate through the forest of human sentience. (If this were the Sunday papers I would have been paid a fortune for that sentence. It isn’t and I won’t but in a parallel universe…!) We can debate if any such universes could be called alternative realities but that discussion is best left to university Philosophy Departments. Let’s not detain ourselves any longer pondering like the late Professor Ayer over the meaning of words but address the uplifting enthusiasm of this novel. It is a delight! Sadly, its easy style leads it to be read too quickly but then this is fantasy fiction aimed at a younger audience. Despite that it is a good read for children of all ages. As an introduction to the science fiction genre this is quite excellent. Our hero, Josh has a Dad who works as a law man and rescue officer in thousands of different realities for the Inter-Dimensional Federation or IDF. This acronym confused me now and again whilst reading this book as it is usually used for the Israeli Defence Force, but what is an acronym between friends? A source of utter confusion, possibly? The Federation want Josh to become his father’s successor as Dad is to become commander of the Federation spaceship, Astron. So a sequence of stories rolls out illustrating the work of the Inter-Dimensional Federation in which young Josh is the star. Josh is zapped out into different actual realities to deal with dinosaurs, to rescue damsels in distress, to help stranded sailors, to recover a broken star-ship lost in space, to freeze the centre of the Moon and chase baddies in the Wild West. Josh has an electronic chum called Tate who is a computer-type wristwatch gizmo thingie of uncertain but miraculous definition. As each adventure ends he is zapped back to motherhood and apple-pie. Then eventually Josh runs into that old favourite loved by writers of time travel: he has to ensure his parents meet so that he can be born and continue to exist. Edge of the seat stuff! This is a cheerful, positive story of simple youthful heroism uncomplicated by nuances. In the cosmic order of things there is nothing new here, but there is plenty of fun. We could all do with a lot more of that sort of thing these days. Forget the elves, the zombies, the vampires and all that sleazy dark stuff. Just send those books to the charity shop. 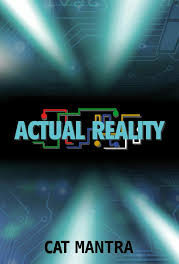 Buy Actual Reality and actually have some good real fun! At £7.99 it is good value. Hi, I’m the author of Actual Reality, and I just discovered your review. I’m most chuffed that you enjoyed it! I’m glad you appreciated it for what it is. Unadulterated fun, with a multiverse of possibilities. Limited only by MY imagination. And I have a BIG imagination. Fingers crossed you will be reading book two in a couple of years. Until then, Cat Mantra out. I have read this book too and absolutely loved it and I am a grandmother of 72!! !